If you’re a drummer and are looking for a pair of decent or even the best in-ear monitors (IEMs) that you can either use in the studio during practice, or even live on-stage, this is all you need to know. There are so many choices out there and it might even be quite challenging to find which ones are more suitable for you. 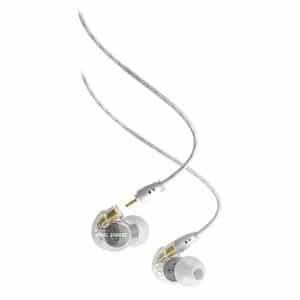 There quite a few things that you should take into account before selecting your in-ear monitors, and these include sound quality, design and comfort, and price, but ultimately, you shouldn’t just settle for anything mediocre – you should look for the best. Drummers play an important role in a band. Drums are very important instruments when creating and playing many types of music. Contrary to popular belief that the vocalist of a band or the conductor in an orchestra is the “leader of the band”, many musicians will agree that it’s actually the drummer who plays as the anchor of the group. The drumbeats dictate the tempo, speed, and all other elements and exciting things you can add on to your music to make it sound like how it’s supposed to sound or how you want it to sound. While every piece of instrument is important, the drums are always the ones that are most noticeable. If the drummer is out of tune or isn’t playing his piece right, it affects the whole band. If the drummer doesn’t do something that he’s supposed to do, then that’s easily recognizable by the audience or the listener. If the vocalist decides not to hit the high note, it’s okay. If the guitarist misses a note, it’s still okay. But if the drummer doesn’t play on a certain beat or slows down, the entire band is affected. With that being said, it is just right to say that drummers deserve the best in-ear monitors. In-ear monitors are basically earphones. When playing along with a band or in front of a cheering and screaming audience, it is easy to lose focus. You will most likely not hear the instrument you are playing or the music of the rest of your band mates. 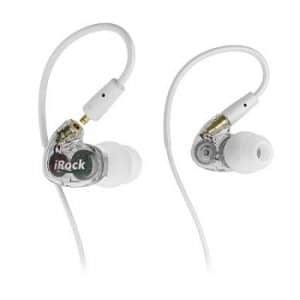 Drummers need these in-ear monitors so that they can hear the music they’re playing and stay on the right beat because again, they are the anchor of the band and losing the right tempo, rhythm and timing will affect the entire band. The in-ear monitors included on the list below are made not just for drummers. In fact, most of these items are made for all kinds of musicians, audiophiles and even simple music enthusiasts. No matter what your purpose is when shopping for the best in-ear monitors for drummers, there are certain characteristics, features and considerations you need to take a look at. Remember that what’s good and effective for one musician may not necessarily be the same for the other so it still boils down to personal preference. But the qualities that are discussed here should be present across all kinds of in-ear monitors before one deserves to be considered the best and worthy of your purchase. If you’re a drummer looking for a pair of in-ear monitors, you must realize that you are not merely getting a pair that you will use for leisure listening. This is a pair you will use for work (or your hobby). You must get the most natural-sounding best in-ear monitors that can produce clear and crisp audio with good bass response because the better the sound, the better you can coordinate your music with the rest of the band and the better you can feel the vibe. When you feel the vibe, it translates to the music you play. Most definitely, you should choose one with superior sound quality and do not settle for anything less than that. Noise isolation is so important when it comes to in-ear monitors. In fact, this feature is so important and it is highly recommended for you to skip any pair of in-ear monitors that don’t have this feature. Sound isolation is the ability to cancel outside noise so you can focus on the sound you hear directly from your in-ear monitors – which is precisely why you’re getting a pair like this. Without a guarantee of effective noise isolation, your best in-ear monitors become useless. Furthermore, noise isolation is important because it’s actually an ear safety feature. If you can’t hear the sound from your in-ear monitors well because of outside noise, the tendency is for you to increase the volume. When the volume gets too loud, of course, that cannot be healthy for your ears. If you will notice, in-ear monitors for drummers are usually earbuds. Full-sized headphones might be good in the studio but if you wear these for hours, it gets tiring, heavy and inconvenient. Some earbuds might have too much pressure on the ears so it is best to have one that is designed to fit most ear sizes securely. Many best in-ear monitors for drummers include several tips in the package with varying sizes so you can change the ones you have to ones that are most comfortable to use. Whether you’re on the stage, in the studio, in band practice or you’re just listening to music for hours, it would be great to have such a comfortable pair. Probably the main reason why earbuds/earphones are most common for drummers is because in-ear monitors stay in place. Full-sized headphones will most likely fall off as soon as you bop your head to the beat, play the drums too passionately, etc. It is just right for you to find a pair of in-ear monitors that will stick to your ears no matter what. Sometimes the size of the ear tips is what matters. As mentioned above, most packages come with several sizes of ear tips so that you can choose one which fits securely into your ears – not only will this stop your in-ear monitors from falling but this also plays a role in blocking out noise. There are also around or over-the-ear earphones that hold on securely to your ears because it is designed to wrap around your ear. On the list below, you will find the best in-ear monitors for drummers in both these designs – earbuds and over-the ear – so you can narrow down your choices easily. Audio-Technica, as most of us already know by now, is definitely one of the best brands when it comes to audio equipment, particularly headphones and earphones. They have several models of full-sized headphones that are being used by many music professionals and audiophiles and so far, they have not disappointed anyone. 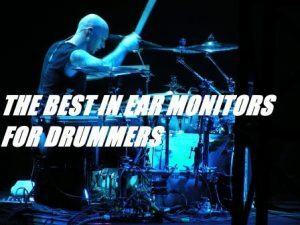 When it comes to finding the best in-ear monitors for drummers, you will realize that the good ones are usually pricey – and naturally, if you’re spending a lot of your hard-earned money on something, you can’t go for a hit or miss, trial or error kind of selection process. 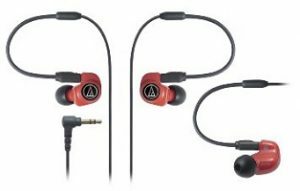 Thankfully, Audio-Technica is giving you the chance to own a pair of in-ear monitor headphones that are fairly priced, attractive-looking and simply hits all the features you need in all the right places. The Audio-Technica ATH-IM70 Dual Symphonic-Driver In-Ear Monitor Headphones sells for only a little over $100 but you can find these on sale for a few dollars less. For its price, you are guaranteed that you are getting the value of every penny you spend on it. The Audio-Technica ATH-IM70 Dual Symphonic-Driver Best In-Ear Monitors give you very clear, crisp, rich and accurate sound, thanks to its built-in dual symphonic drivers. You get the necessary punch on the bass and good emphasis on the treble – it basically delivers any drummer’s needs when it comes to getting the right sound. As of writing time, it has already received many of outstanding reviews from amateur and professional drummers alike. 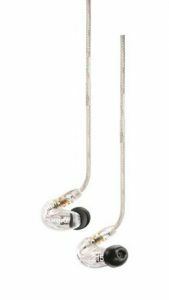 Owners of this pair of in-ear monitor headphones have nothing but great things to say especially with the sound quality and the sturdy built of this product. As soon as you hold this pair in your hands, you already feel how durable it is and you get the confidence that this will last for a long time. Comfort is also topnotch. The Audio-Technica ATH-IM70 Dual Symphonic-Driver In-Ear Monitor Headphones is built with an ergonomic design and soft ear tips that fits securely into the ears so you won’t have to worry about your earphones getting lose while playing the drums with all your might. If you are willing to shell out a bit of money on a pair of in-ear monitors, this one will be an investment you won’t regret. This next pair that took the second spot on this list of the best in-ear monitors for drummers is not really made for drummers only but for all kinds of musicians. You can use it on stage, in the studio or even on the go and you will still be very satisfied with what it can offer. Just half the price of the Audio-Technica that went right before this, the MEE Audio M6 PRO Universal-Fit Noise-Isolating Musician’s In-Ear Monitors sells for only $50 or even less. You can choose from clear or smoke colors, which are both very attractive looking pairs. More importantly, for its price, it is quite a powerful and remarkable pair. 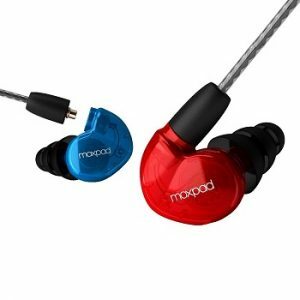 In fact, almost 900 online customers have given these earphones an average of 4.1 out of 5 stars in ratings with very satisfied feedback and comments. The MEE Audio M6 PRO Universal-Fit Noise-Isolating Musician’s In-Ear Monitors is great for drummers as the sound produced is studio-tuned, crystal clear with a deep punch of bass – exactly what drummers usually look for from in-ear monitors. It has an impressive noise-isolating feature as well that makes this pair even more functional and enjoyable to use. What’s even better is that it is comfortable to wear and its universal-fit feature gives you a secure fit. The detachable cables come with a built-in microphone and remote with volume control so you can use this on smartphones, tablets and your computer as well. For its price, you are actually getting a bargain as the package already includes an extra cable, 6 sets of silicone ear tips, foam ear tips and a protective carrying case. While this is a very durable pair that’s meant to last even if you intend to use this for hours on end every single day, you can have more confidence and peace of mind as the manufacturer throws in a year’s warranty. Another Audio-Technica earned its well-deserved spot on this list. Though it might seem like an expensive choice as the Audio Technica ATH-IM02 SonicPro Balanced In-Ear Monitor Headphones sells within the $170 range, you are actually getting quite a deal from this as it used to sell at $300 – so you have to realize, you’re getting the sound quality and build quality of a $300 pair of in-ear monitor headphones for a very low price. It is a very worth-it purchase and happy customers can prove that. Today, this pair has already received plenty of positive reviews from critics, customers, and audiophiles. The most important feature that the Audio Technica ATH-IM02 SonicPro Balanced In-Ear Monitor Headphones can offer is its amazing sound quality. It is able to produce such clear, pure and crisp sound through its exclusive dual balanced armature drivers. It is very comfortable to wear too thanks to its ergonomic design that comes with formable wire cables. The cables are actually detachable too. In addition, this pair has a horn-shaped conductor pipe which the manufacturer calls the “Acoustic Horn”. This feature allows reduction of acoustic radiation resistance for an even more natural production of sound. 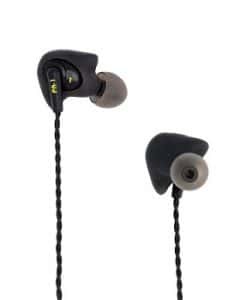 The Audio Technica ATH-IM02 SonicPro Balanced In-Ear Monitor Headphones is a very durable pair of headphones. Many of the customers who already own this pair shared that this pair feels expensive and once you hold it, you know that it’s a sturdy piece of device. Each package already includes a carrying case which is perfect for the drummer on the go, three pairs of silicone earpieces in small, medium and large so you can choose whatever gives you the most comfortable fit and medium-sized comply foam earpieces. Again, the Audio Technica ATH-IM02 SonicPro Balanced In-Ear Monitor Headphones aren’t the cheapest you’ll find in the market. It isn’t the most expensive either as there are some drummer best in-ear monitors that can cost you a lot more. But with the comfort, sound quality and durability this pair offers, you are guaranteed that you’re getting a good deal out of these Audio Technica headphones. Of course, a list like this, especially for a pair of earphones that’s meant for musicians, wouldn’t be complete with one from Shure. The brand is known for making more than satisfying audio equipment that even audiophiles would appreciate. There’s no wonder why thousands of customers have opted for the Shure SE215-CL Sound Isolating Earphones and so far, it has received an average of 4.1 out of 5 stars rating from over 2,000 online customers. It gained an impressive number of good reviews from critics and customers from other sites too. It used to sell at $200 but Shure slashed down the price to just less than $100. You are getting the value of a more expensive pair of earphones at an affordable price, so it’s a winning situation for you! Now don’t get confused with the model number. The SE215-CL is the same with the SE215-K. 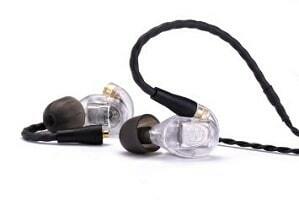 The -CL means “clear” and the -K means “black”, which are the colors available for these best in-ear monitors. 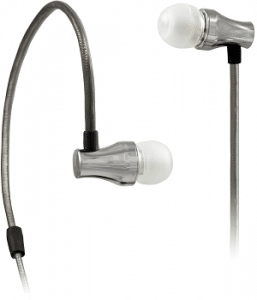 Why is the Shure SE215-CL Sound Isolating Earphones great for drummers? It is actually great for any kind of musician but drummers in particular will love how such a small of earphones can prevent outside noise pretty well. This pair does that with its sound isolation technology that makes this ideal to use whether you’re drumming on-stage, inside the studio for recording or for band practice and even when you’re on the go. It is very comfortable to wear too, thanks to its optimized nozzle angle that securely fits right in your ears. The sound quality is also amazing. Drummers would love that rich bass and impressive trebles and you can get that from this pair. A pair of really good in-ear monitors for drummers is worth the investment. You must know by now that a full-size pair of headphones is rather uncomfortable to wear especially if you’re banging the drums away with all your passion, not to mention all that sweat contained in the earpieces! This model is comfortable, it has great sound quality and it is durable too. It’s just a bonus you get additional soft and flexible sound isolating sleeves or ear tips that come in multiple sizes so you can get your perfect fit. And you even get a carrying case with the package too! Despite its higher than usual price, you are still getting a bargain with the Shure SE215-CL Sound Isolating Earphones. A fairly new model that was announced in the earlier part of this year (2016), the Fender FXA2 Professional In-Ear Monitor Headphones is part of a series of Fender In-Ear Monitors and the FXA2 is actually the more affordable pair compared to the other ones. Priced sensibly, it still isn’t cheap at all yet these are professional best in-ear monitors so you can expect superior quality that’s unlike any other random cheap pair you’ll find off the shelf. Just one look at the Fender FXA2 will already give you the impression that it is truly remarkable. It is very solid and the construction is just so durable so you can expect it to last for many years. As of writing time, it is still just a few months’ old so there’s really no proof yet that it is a strong and long-lasting pair but again, the quality is very promising. 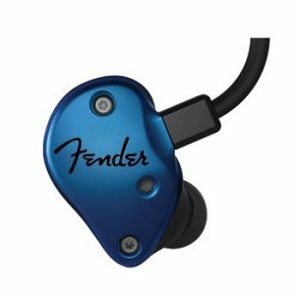 The Fender FXA2 Professional In-Ear Monitor Headphones features custom 9.25mm precision rare-earth drivers that come with a Groove-Tuned port. The 3D-printed DHT shell fits 95% of your ears so for a more comfortable and secure feeling, plus it does so well in sound isolation too. The sound is so natural, lifelike and clear, thanks to its impressive 8Hz-23kHz frequency response. The sound also remains distortion-free with its 112dB at 1mW frequency response. The other pairs on this series – FXA5, FXA6, FXA7 have even more powerful features but of course, it comes with a price. The FXA7, in particular, sells at the very top of the range. However, whether you’re an amateur musician, you play drums only as a hobby or if you’re a professional, you will still love what the Fender FXA2 Professional In-Ear Monitor Headphones can offer. For its reasonable price, you are getting a great deal as the package already includes a deluxe carrying case, SureSeal tips, cleaning tool and the cable. There are already a few reviews coming from critics and professionals that you can find online. So far, there are not many helpful feedback you can find from actual customers simply because this is a new product. However, if you compare the features of this pair to other pairs in this price range, you will see how outstanding the FXA2 is and buying it is not really a risk, rather a great opportunity for you to enjoy drumming on stage or in the studio more. From a quite pricey pair right before this, we’re moving on to a more affordable yet equally attractive and impressively powerful pair of in-ear monitors. The GranVela® X6 PRO Noise-Isolating Musician’s In-Ear Monitors sells at a very competitive price and you can choose from black, blue, red, and red and blue. Again, you have to understand that since it’s a rather affordable pair, you can’t expect performance like one that would cost a few hundred dollars; however, in its price range, this is definitely one of the best and you can even compare it to ones that cost double or triple its price. What’s make this pair of in-ear monitors special is its great sound quality. Through its detachable high quality cables that come with gold plated connectors, you can enjoy seamless connection with great frequency response. Furthermore, according to happy owners who generously left high ratings and good feedback, these earphones produce rich bass and clear and natural sound. Another important feature that all best in-ear monitors for drummers must have is the ability to isolate outside noise. The GranVela® X6 PRO Noise-Isolating Musician’s In-Ear Monitors have an excellent sound isolation technology which allows you to hear every important detail of the music you’re listening to or playing along to while blocking out the excessive outside noise so you can maintain your focus. You can even enjoy using this pair whether you’re on stage on in the studio and you can use it for hours on end, as it is lightweight and very comfortable to wear. It features a low-profile design with an optimized nozzle angle so that the earphones would fit securely and comfortably into your ears. The over-the-ear fit is so secure and comfy so even if you’re playing the drums with all your might, you won’t have worries about the earphone falling off. An additional feature that you will also appreciate is that the GranVela® X6 PRO Noise-Isolating Musician’s In-Ear Monitors has an in-line control and in-line microphone. So when you’re done with band practice or a performance, you can still use this pair to listen to music and even make and receive calls on your smartphone. For most drummers, the basic requirements for a good pair of in-ear monitors are clear sound and excellent noise isolation. The Westone UM Pro20 High Performance Dual Driver Noise-Isolating In-Ear Monitors is quite an investment as it sells at the top of the price spectrum, but it does its job well and you know you’re not getting just any mediocre pair. A cheaper version came out at just half the price, which has a single driver or you can spend $100 more to get the triple driver version. But based on critic reviews as well as comments from professional drummers, the dual driver version is more than enough for one to be satisfied with performance. This is a professional’s pair and whether you’re playing drums for a small group or you’re on an arena’s stage, you will still appreciate the range and output the Westone UM Pro20 High Performance Dual Driver Noise-Isolating In-Ear Monitors can produce. It’s so good at noise isolation and in fact, you can get up to 25dB of ambient noise reduction. This is great for drummers, bass players and guitarists and other musicians looking for the best in-ear monitors. Rich bass, impressive trebles and overall great sound quality that’s clear, natural and crisp are what you can expect from the Westone UM Pro20 High Performance Dual Driver Noise-Isolating In-Ear Monitors. It is just a bonus that it’s very comfortable and convenient to wear too. Its design features and up and over cable routing that keeps your earphones secure into your ears and helps prevent micro phonics too. So far, it has received hundreds of positive customers ratings from critics, customers and reviewers from other a wide array of websites. The package is already complete so you’d only have to spend for this pair once. The Westone UM Pro20 High Performance Dual Driver Noise-Isolating In-Ear Monitors already comes with premium comfort tips, and EPIC replaceable cable, mini-monitor vault and a cleaning tool. The manufacturer even throws in a 2-year warranty for added peace of mind and confidence for the customers. Another GranVela made it to this list and thankfully, it’s another pair of budget headphones minus the cheap features. Best for musicians including drummers, DJ’s and even for working out, the GranVela® A8 High Fidelity Dual Symphonic-Driver Earphones are sold at a very sensible price. Now the GranVela® A8 High Fidelity Dual Symphonic-Driver Earphones might be affordable but it sure is powerful and comparable to the more expensive pairs you’ll find in the market today. It is great that these in-ear monitors are built with superior quality materials such as a high-quality synthetic housing and lightweight shell. These are very durable and sturdy materials so you know that this pair is strong enough to last for many years of daily use (and sometimes even abuse). More importantly, these best in-ear monitors with detachable cables are so comfortable to wear. The package includes fours pairs of ear tips so you can choose the one with the best fit not only for comfort but also for more effective noise isolation. The best feature of the GranVela® A8 High Fidelity Dual Symphonic-Driver Earphones are its built-in dual symphonic drivers that make sound quality so clear, crisp and natural. You get the necessary bass punch you need as a drummer and those impressive trebles too. In fact, many customers claim that the A8 is chance they had to take as the brand is not the most popular when it comes to audio equipment and thankfully, this model was a pleasant surprise. It sounds and feels so much better than expected, and for its price, you might probably be expecting a cheap pair but once you hold the A8, you get that feeling that it’s actually expensive. Now this professional pair does more work than just being used by musicians in the studio or on stage. The GranVela® A8 High Fidelity Dual Symphonic-Driver Earphones has detachable cables and best of all, this pair has a built-in microphone. Use it to listen to music on your smartphone and take calls hands-free or attach it to your computer for voice or video conferencing purposes. Outstanding customer reviews and ratings of the SoundSprocket PA-1 Pro Audio says a lot about this pair of in-ear monitors. It isn’t as expensive as many of the pairs discussed before this number and it probably isn’t the most popular pair as well; however, it does its job so impressively and once you own one, you’ll never want to work with another pair of in-ear monitors again. It is very affordable too considering its power and features. Selling at only $140, it has been said that the SoundSprocket PA-1 Pro Audio is comparable to earphones and best in-ear monitors that are double its price. Before we proceed on describing how amazing the sound quality is, it would be great to describe how nice the actual product is. The cables are braided so that tangles can be prevented and it makes the pair sturdier too. There are two extra jacks that come with the package so you can use it with practically all kinds of audio equipment and sources you are using. The cable is long enough and the earpiece securely and comfortably fits into the ear – perfect for drummers who move a lot as they play passionately along with the beat on-stage. It’s just awesome that you also get a single-button control and an in-line microphone built with this pair too so you can use it not only when playing or listening to music but also for hands-free calls too. The package comes with three pairs of ear tips in different sizes so you can get the perfect fit not only for comfort but for more effective noise isolation too. Lastly, you get a nice-looking round carrying case where all the extra jacks, small items and the actual in-ear monitors can be stored when not in use. Without a question, construction, durability and comfort is topnotch with the SoundSprocket PA-1 Pro Audio. When it comes to sound quality, it is superior too. In fact, as mentioned, the sound quality you get out of this pair is comparable to more expensive ones so getting the chance to simply listen to music or play the drums with these on your ears will always be a pleasure. The audio is so natural, clear, crisp and very precise with just the right richness of bass and pureness of sound. Spending more than 100 dollars might be a little too much for some but if you’re a professional or you’re an amateur drummer who needs to step up on his career, then this pair is a very practical investment you will surely not regret. Probably not the most important requirement but something good to have as well is an attractive pair of in-ear monitors. Especially if you’re a drummer playing live, you’d want something that looks good on stage or on your music videos. Very simple yet elegant and classy at the same time, the Wi Digital SEBD10 Wi Sure-Ears Professional Noise-Isolating In-Ear Monitors Optimized for Bass Drums and Keyboards comes in polished silver brass and will look, feel and sound good in any stage setup. The best feature that owners of this pair of the best in-ear monitors love about is the comfort it can offer. It feels and fits so comfortable, it is easy to wear, convenient and light on your ears so even if you use it for hours on end, you won’t feel any pressure at all. Its universal secure-fit feature also comes in handy for drummers who would bang their heads along with the beat while playing on-stage. The cable is so durable too so you know that it will last for many years of daily use. Its exclusive tangle and kink-resistant design is something to love about this pair too. The actual in-ear monitors are compatible with almost all audio equipment and systems. Whether you’re sweating it out on stage or you’re going for a run or a workout schedule in the gym, you can use your Wi Digital SEBD10 Wi Sure-Ears Professional Noise-Isolating In-Ear Monitors Optimized for Bass Drums and Keyboards too as it is sweat-proof and designed to handle all types of weather conditions and even very heavy perspiration. Most importantly, the Wi Digital SEBD10 Wi Sure-Ears Professional Noise-Isolating In-Ear Monitors Optimized for Bass Drums and Keyboards produces such an impressive sound quality. It gives you rich bass, good trebles and ultra-clear and crisp sound that are so precise and accurate. It does so well in noise isolation too so that you can focus while playing and drown out the bad noise from the outside.